If Santa brought you a new phone or tablet this holiday season, or you couldn’t resist the sale price on a 70-inch TV, you might be wondering what to do with your old electronics. You’re not alone. 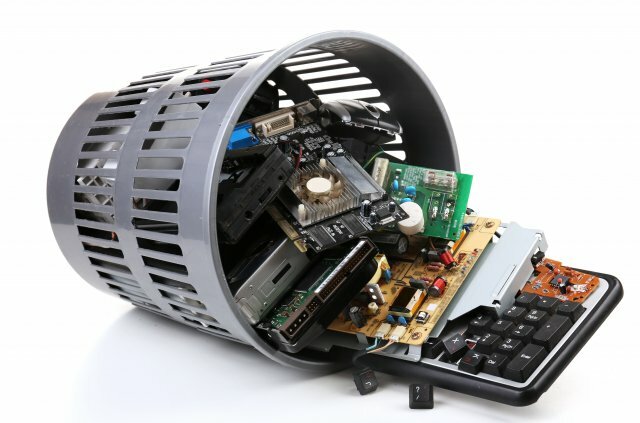 Overall, Americans get rid of 7 million tons of old electronics – or “e-waste” – each year. That adds up to about 42 pounds per person! But that old flip phone or CD player shouldn’t go in your household trash or recycling – e-waste must be recycled separately. Consumer electronics often contain metals like mercury and lead, which can harm the environment. Proper e-waste recycling safely removes any toxic materials, keeping them out of the waste stream. There are a number of options to consider. Donate: Many local charities can make use of working devices. Two national programs include Cell Phones for Soldiers, which provides free airtime minutes to servicemen and women, and the 1Million Project, which helps connect low-income students to the Internet. Mail back recycling: Safely dispose of your old electronics without even leaving the house! Simply order a prepaid box, fill it up, and mail your electronics back to Republic Services. Boxes can be ordered through Republic Services’ Electronics Recycling Mail-Back Program. Drop off at local collection events: Many local Republic Services facilities collect e-waste throughout the year, especially in the spring and fall – check RepublicServices.com/shop for options. Or search Earth911 or Call2Recycle to find an e-waste drop-off site near you. There’s another upside to recycling old electronics: the recovery of usable – and valuable – materials. Consumer devices contain gold, silver, copper, glass, and plastics, all of which can be reused. And recycling uses less energy than mining or manufacturing new materials. For example, 1 million properly recycled cell phones can recover 35,000 pounds of copper, 772 pounds of silver and 75 pounds of gold! Finally, what to do with lithium-ion batteries? Today, lithium-ion batteries power millions of devices, including smartphones, laptops, power tools, and toys. Their compact design makes them ideal for portable devices but leaves little protection for the delicate wiring inside, which can explode if dropped or smashed. Sound far-fetched? In 2017, 65% of waste facility fires in California were caused by lithium-ion batteries. These batteries must be recycled as e-waste – not in household trash or recycling containers. Want to learn more? Pull out that new tablet or laptop, and check out Republic Services’ electronics recycling programs. Together, we can help preserve our Blue Planet®.